Buffalo Bill on the Cowboy. I should greatly like to say a few words respecting a topic which I much regret to find is understood in the inverse proportion to which it is discussed. 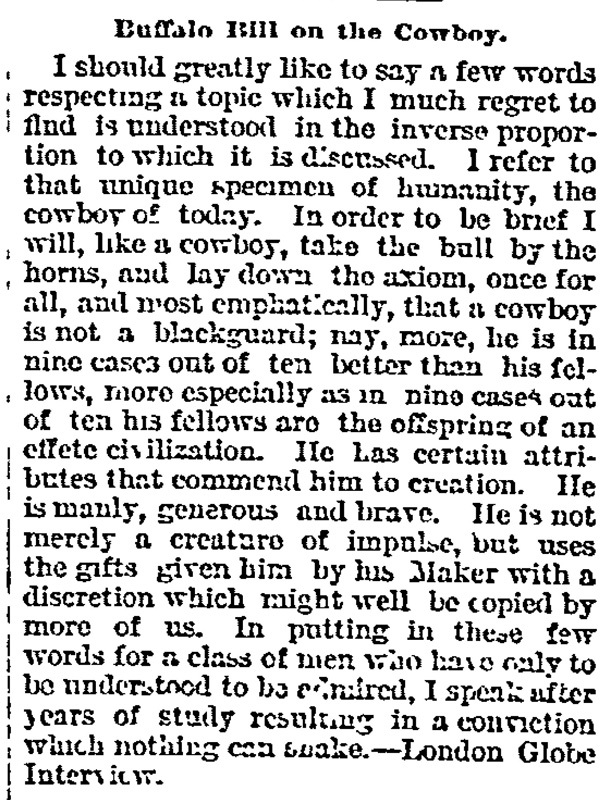 I refer to that unique specimen of humanity, the cowboy of today. 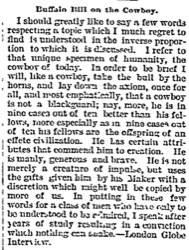 In order to be brief I will, like a cowboy, take the bull by the horns, and lay down the axiom, once for all, and most emphatically, that a cowboy is not a blackguard; nay, more, he is in nine cases out of ten better than his fellows, more especially as in nine cases out of ten his fellows are the offspring of an effete civilization. He has certain attributes that commend him to creation. He is manly, generous and brave. He is not merely a creature of impulse, but uses the gifts given him by his Maker with a discretion which might well be copied by more of us. In putting in these few words for a class of men who have only to be understood to be admired, I speak after years of study resulting in a conviction which nothing can shake.—London Globe Interview.